I bought this silicone mold at 100yen shop (Can☆Do). 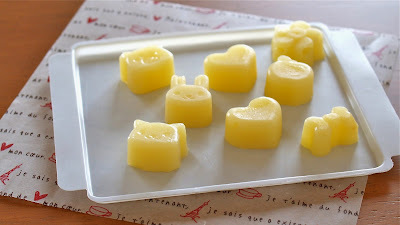 I followed the microwave caramel candies recipe that came with this mold, but it didn't work and used up all the whipping cream… so I ended up making the caramel candies using only milk using a pot. Then it worked as seen in this video!!! Adding butter is necessary to get this chewy texture and rich taste (it will be a bit flaky if you skip butter). Adding diced almonds or sesame seeds is nice! ENJOY!!! 1. Put all ingredients in a pot and bring to a boil on medium. When bubbles come out, turn down to low and simmer until thick mixing with a wooden spatula (make sure you don't burn it). 2. Drop the caramel mixture into ice water and check if it forms an elastic ball. If it melts, you want to simmer more. 3. You can pour it into a silicone mold, or a square pan lined with parchment paper. Cool in the freezer for over an hour until firm. Cut it up if necessary. They can melt easily at room temperature, so better kept in the fridge or freezer!